The Touch Bar replaces the function keys that have long occupied the top of your keyboard with something much more versatile and capable.2 It changes automatically based on what you’re doing to show you relevant tools you already know how to use — system controls like volume and brightness, interactive ways to adjust or browse through content, intelligent typing features like emoji, and more. And now Touch ID is available on a Mac, enabling instant access to logins. Select a photo from your library, rotate images and add a filter. Expand, contract and customise system controls to reveal volume, brightness and more. Get quick access to formatting options and emoji in apps like Messages and Mail. Now you can unlock your Mac in an instant. Quickly access system settings and locked notes. And even switch between users — all with the touch of a finger. Adjust your layers, pick a hue, control brush size and so much more. The 15-inch MacBook Pro features a powerful Radeon Pro discrete GPU in every configuration. Manufactured with a 14nm process, Radeon Pro graphics combine outstanding power with outstanding power efficiency. And now 4GB of GDDR5 memory comes as standard on the top configuration, giving you fluid, real-time performance for pro tasks like rendering 3D titles in Final Cut Pro X. Every 13-inch model features powerful integrated graphics with 64MB of embedded DRAM, which accelerates graphics tasks. That means more time for what matters most — creating amazing work. Edit multicam projects in Final Cut Pro X with up to three streams of full-resolution 4K video on the 15-inch MacBook Pro. MacBook Pro includes a solid-state drive that’s incredibly fast, with sequential read speeds up to 3.2GB/s. The 15-inch model is available with up to a 2TB SSD — enough space to take even your biggest projects with you, without having to take an external drive. And its memory is both high speed and power efficient. It all works together to help you boot up, launch multiple apps or import huge files in a flash. With seventh-generation Intel Core processors, MacBook Pro delivers amazing performance, with Turbo Boost frequencies up to 4.1GHz. So you can move fast — even when powering through pro-level processing jobs like rendering 3D models and encoding video. At the same time, it can conserve energy when taking on lighter tasks, like browsing the web and checking email. And 10-bit HEVC hardware acceleration comes as standard on MacBook Pro, which will let you take even more advantage of the boosts in 4K video compression and streaming performance in macOS High Sierra. The thinner the notebook, the less space for cooling. So Macbook Pro incorporates innovations throughout the system that efficiently eliminate heat - increasing airflow during intensive tasks like editing video, playing graphics - heavy games and transferring huge files. 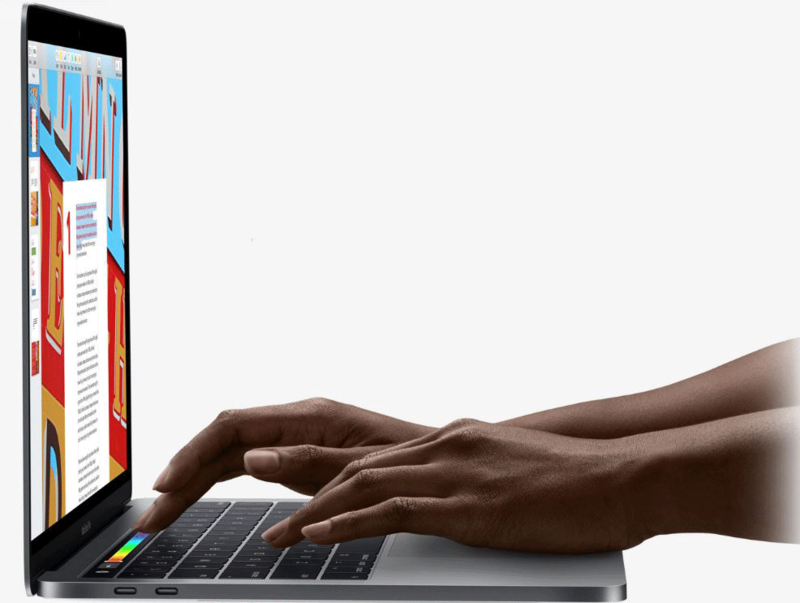 MacBook Pro features P3 colour, which makes 25 per cent more colours available than standard RGB — revealing a much broader range of greens and reds.